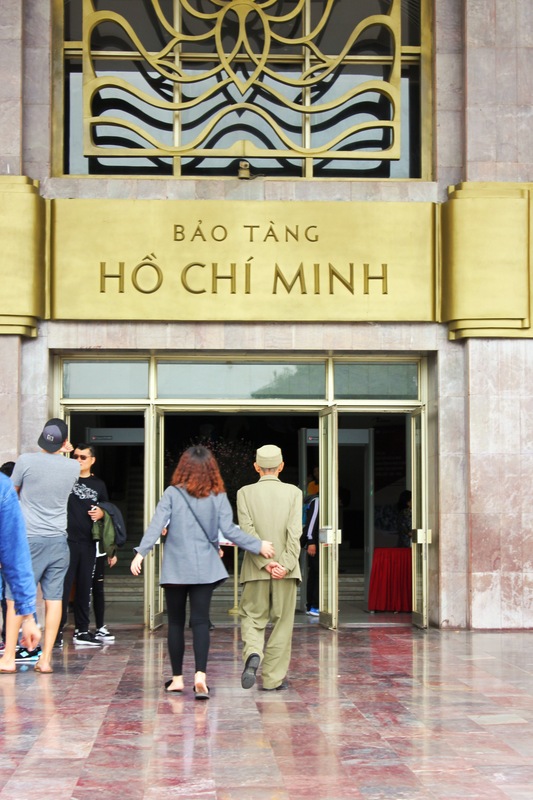 We went to the Ho Chi Minh mausoleum in Hanoi, and, afterward, to the museum dedicated to the “father” of Vietnam. We passed these two on the steps up; the old man in a uniform and his companion, walking slowly. I held back. Something about his bearing, his age, and the determination and dignity he exhibited while climbing up the stairs told me that he’d fought for his country’s independence, had lost friends, had killed, just so Vietnam could have its own place in the sun. I wondered what it must have been like to be in America in 1817, and see old men sitting on porches smoking pipes, chopping wood, or riding through city streets, and know that they’d fought under Washington for America’s independence. Did people stop them on the street and thank them for their sacrifices? Did they sit around pubs and reminisce about famous battles while their children and grandchildren listened, soaking up the stories? Or perhaps, like the younger people to the left of the photo, it wasn’t that big a deal; they were just more old men, who always have tales to tell, and didn’t bear much attention. But I took a moment to let the awe sit in: the old man, his hands clasped behind his back, walking with quiet pride in his plain green uniform, was one of the founders of a country. There aren’t a lot of people around today who can say that.